In a special Non-League Spotlight edition of Across The Pitch, Phil and Arran sit down with Loughborough Dynamo manager Lee Attenborough. They discuss the happenings around Loughborough, and the unique challenges and ups and downs of managing a club that is underfunded even compared with other teams in their division. Lee is at 28-years-old the youngest manager in Northern Premier League Division One East history, and has a chance with a win this Saturday to lead Dynamo to their best finish in club history. In Part 2 of episode 28 the farm animals have gone home, but Phil, Arran, and Matt return to talk about the UEFA Champions League quarter finals. They discuss what happened in the previous round, who they think will advance, and Phil makes a shocking pick to win the whole thing. They also debate who the top player left in the tournament is, and we introduce a brand new author, Darren Woodhead, to the Across The Pitch blog team! On a very special Farm Animal Night of Across the Pitch Phil, Arran, and Matt are cheesed off after Phoenix Rising's loss to the expansion Austin Bold. They give an unhinged and oftentimes emotional take on the night's game. On a side note, @yourPHXCW we do compare you to a certain metal water boiling kettle, however, your video apology is noted and accepted. Hey, even NBC had The Heidi Game. UEFA Champions League recap coming in part 2. In a very special interview Phil, Arran, and Matt chat with Blackpool legend Brett Ormerod. Brett scored at all 4 levels of English Football for Blackpool, including the Premier League and the winning goal in the EFL Championship playoffs. Brett also discusses his time with Accrington Stanley, tells stories about his former coaches, and a bit about life after football. If you want to hear more of Brett, you can hear him on the Under The Cosh podcast https://podtail.com/en/podcast/undr-the-cosh/. In a special Sunday Conversation (recorded on a Saturday) edition of Phil and Arran sit down for another chat with 50 Years of Accrington Stanley author Darren Woodhead. They discuss what will be going into the final chapter of the book, due out in July, that you can preorder at onstanleyon.com or purchase at the grounds. They also talk about what Stanley needs to do down the stretch to stay up in League One, and Arran and Darren nerd out for a moment about their shared love of cricket. In Part 2 of this 3 part 25th episode, Phil, Arran, and Matt break down what's going on in EFL Leagues One and Two. They talk about what teams are most likely to get promoted, make the playoffs, or become relegated. They also introduce Portsmouth as team of the month for April, and discuss the meaning of the term tin pot. They also look at the heated battle to stay in League One, and follow up on whether Notts County, Yeovil, and Macclesfield can stay up and avoid being sent to non-league. Stay tuned for Part 3 upcoming which is a deep dive on loan players and financial issues in the EFL. On Part 1 of this week's special, multi-part, 25th episode, Phil, Arran and Matt talk about the Premier League and EFL Championship races at both the top and bottom ends of the table. They also discuss the opening game at the massive latrine also known as the new Tottenham Stadium, and the unusual friendship between WWE legend Mick Foley, and Sheffield United's Billy Sharp. In the upcoming parts they will discuss Leagues One and Two, and a deep dive on loan players and financial issues in the EFL. This week Phil, Arran, and Matt interview mlssoccer.com MLS Fantasy writer Schuyler Redpath about the best strategies for winning your league. Schuyler is the 2011 National Champion for MLS Fantasy and each week has a list of the top players. He shares with us some of his secret strategy's including the Autoroo, and at the end we play a bit of Premier League trivia with him. A very entertaining and informative chat! On this week's episode, Phil, Arran, and Matt discuss the madness that is the relegation battle in the EFL Championship, League One, and League Two. Additionally, they do a deep dive on the financial crisis with the Bolton Wanderers. They also talk about the Final Four of the FA Cup, and what the future could hold for Jose Mourhino and Mesut Ozil. They also play a sneak preview of a new song called L.A.W. by past guest Travis Kenny. In this week's episode Phil and Arran (Matt is out this week) do a deep dive on the race at both ends of League One. In addition, they talk about what's going on with the UEFA Champions League, the fight to avoid relegation from the Premier League, and player of the week, Wolverhampton striker Raul Jimenez. They also talk about the first game of the Phoenix Rising season, and what their head coach Rick Schantz may have learned from Jurgen Klopp. Also, a special announcement from Phil. On this week's episode Phil, Arran, and Matt discuss some surprise results in the UEFA Champions League, preview the just underway MLS season and a recap of the exciting Snow Classico 3, talk about whether or not Liverpool's title hopes are gone with the wind, and exciting breaking news announcements. Plus, a listener question about what are the reasons that a team would want to loan a player to another team, and what does the future hold for Gareth Bale. In this week's special episode, Phil, Arran, and Matt sit down with Phoenix Rising all-time leading scorer, Chris Cortez, and talk about his move to Thailand and more. Find out why Chris decided to make the move to the Far East, some of his favorite Phoenix Rising memories and goals, and where Chris thinks his career may take him in the future. This is a can't miss, as this is it is his first English language interview since his transfer to Chonburi FC and subsequent loan to Ayutthaya United. Chris also gives a heartfelt thank you to the supporters and his former teammates in Phoenix. On a special, Sunday Conversation, edition of Across The Pitch, Phil Kennedy sits down with Darren Woodhead, author and historian of Accrington Stanley. They discuss his upcoming book commemorating the team's 50 years at the Crown Ground. They discuss things that are happening with the club past and present including Darren's first hand account of celebrating with the team after winning League Two in the 2017-2018 season. You can pre-order a copy of the book here for just 8 quid plus postage. In part 2 of the episode Phil, Arran, and Matt discuss the situation that is happening at Chelsea, and what they think is the future there for Maurizio Sarri. Additionally, they do a break down of the races in the EFL Championship, League One, and League Two. This includes a discussion about the dominant season Luton Town is having, and a check in on Newport County and Notts. We also announce a special Accrington Stanley related guest that is upcoming, and news about a shirt raffle. In our special 2019 Phoenix Rising season preview Phil, Arran, and Matt go over the roster from top to bottom including a look at players who have come and gone from last season. They take an in depth look at Adam Jahn who is pegged to be the team's top striker this year, and discuss what other holes in the roster still need to be filled. They also talk about returning players like Solomon Asante, new additions like Joey Calistri, head coach Rick Shantz, a pizza named in the honor of Doueugui Mala, and much more! In this special edition, Phil Kennedy, Arran Airs, and Matt Robards sit down with Minnesota United FC announcer Callum Williams. This interview, which is the first edition in our Callum Club series focuses on the upcoming MLS season, Minnesota's latest signings and acquisitions, Callum's thought's on the Phoenix Rising, and more. We also discuss how the MLS stacks up against other leagues around the world and whether or not David Beckham deserves a statue in Los Angeles. A special edition as Phil Kennedy and Arran Airs sit down with Newport County A.F.C. striker Padraig Amond prior to their big match-up with Manchester City in the 5th Round of the FA Cup. Big goals against Tottenham, Leicester City, and Middlesbrough. They also talk about the League 2 season, his career with Accrington Stanley and Grimsby, his sport column in Ireland, coaching aspirations, and whether or not he would ever consider coming to the MLS. In tonights episode Phil, Arran, and Matt dedicate their team of the month for February in support of Daryl Grove of the Total Soccer Show who recently announced he is battling cancer. You can find a link to donate to Daryl's GoFundMe on our homepage or donate by clicking here https://www.gofundme.com/team-daryl-grove. We also discuss the movings about of the January transfer window, upsets in Round 4 of the FA Cup, and a bit on footballers named Callum. We also answer a listener question about our home town Phoenix Rising FC, and say farewell to our January team of the month Luton Town. This week Phil, Arran, and Matt sit down with American Outlaws Phoenix Chapter President Ryan Shirah. AO is the official supporters group of the U.S. Mens National Team. Ryan tells us about his experience with setting up for this week's match in Glendale against Panama. He also tells us more about how the club works, and we have an in depth discussion about new coach Gregg Berhalter, up and coming players to watch, the Women's World Cup, and more. Ryan is also know for dressing up as George Washington at the U.S Team game and hosts his own podcasts Shat The Movies (http://shatthemovies.com/) and Shat On TV (https://shatontv.com/). 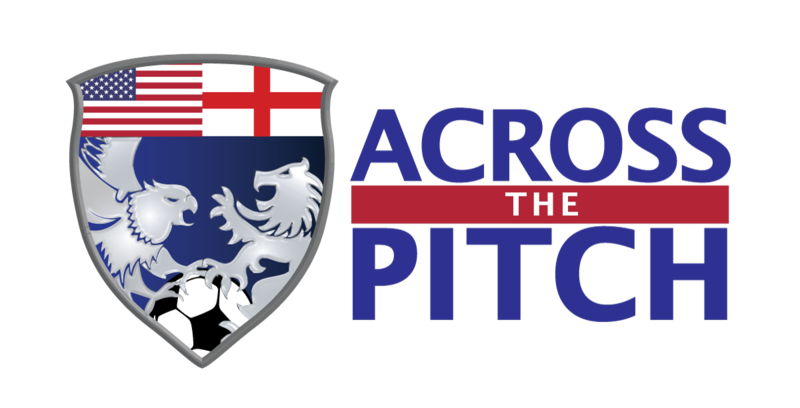 On this special edition of the Across The Pitch Podcast, Phil, Arran, and Matt sit down with veteran Accrington Stanley midfielder Scott Brown. (Scott Brown also appears on episode 2). They discuss the upcoming FA Cup match with Derby County at the WHAM Stadium, a wild match at Charlton, the departure of goalkeeper Connor Ripley, the team's latest additions in the January transfer window, and what is The Gaffer, John Coleman cheesed off about. This week Phil, Arran, and Matt discuss the retirement of legendary Arsenal and Chelsea goaltender Petr Cech, as well as player of the week David De Gea as part of a deep dive on goalkeepers. They also discuss athletes in American sports with a soccer background, the FA Cup rematches, more on our team of the month Luton Town, and how will Tottenham fare without Harry Kane and Heung-Min Son. This week guest analyst Matt Robards joins Phil and Arran again as they cover team of the month Luton Town and the departure of their manager Nathan Jones, their upcoming match with Sunderland, the League One title race, and also do a deep dive on the hit Netflix documentary series, "Sunderland Til' I Die". Additional topics include upsets in the FA Cup and player of the week Rúben Neves of Wolverhampton. On this week's episode we break down an epic English Premier League match-up between Manchester City and Liverpool that is decided by a mere 11 millimeters. We also discuss the FA Cup third round action, our team of the month Luton Town, and our player of the week Son Heung-Min of the Tottenham Hotspur. Plus, a listener question about the best and most surprising EPL players so far this season. This week Phil and Arran ring in 2019 with a musical themed episode. We sit down with Travis Kenny, lead singer for The Glides (who provide the official Across The Pitch intro music). Travis talks about his musical products and talks about his beloved Seattle Sounders, and a childhood meeting with the legendary Pelé. We also announce our team of the month for January, Luton Town, winners of our fan contest. Guest co-host Matt Robards joins the Across The Pitch team today to discuss what new players your team may be getting for Christmas during the upcoming January transfer window. In depth analysis on Christian Pulisic and Callum Wilson, and where they may be headed. Our player of the week is Kevin De Bruyne and we discuss who is the best Belgian between De Bruyne and Hazard. Also find out about who the Phoenix Rising have recently signed to make up for the hole left by the retirement of Didier Drogba. On this week's edition of the Across The Pitch Podcast Phil and Arran mourn the loss of their favorite topic, José Mourhino, after he has been sacked from Manchester United. They discuss United's future, post Mourhino, and the recent struggles of Arsenal. Also on tap this week's featured player, Aaron Wan Bissaka, the return, of Kevin de Bruyne, and our first sponsor @PatOrmsby17. We also announce the newest addition to the Across The Pitch team, tactical expert Matt Robards. This week Phil and Arran discuss the Final 16 in the UEFA Champions League, with a debate about whether or not fans should root for rival team's from their favorite league in European Leagues. We also talk about the Arsenal match-up with Qarabag in the Europa League with a profile on Qarabag manager, and Azerbaijani football legend Gurban Gurbanov. We also talk this week's English Premier League match-ups, and a listener question about Arthur Blank and Newcastle United. Plus, we talk about our team of the month Sheffield United. This week Phil and Arran discuss José Mourhino's future at Manchester United, and a deep look into other EPL action from this week. We also discus who may be the frontrunner for EPL MVP and break down who has the most goals and assists. At the end of the show we answer a listener question, and have a trivia contest to announce our team of the month for December. In this week's episode we discuss the UEFA Champions League and how the English team's are doing in the competition. We also talk about upcoming local derby's in the English Premier League, give a break down on what the UEFA Europa League is, and break down the difference between the EFL Cup and FA Cup. Our first listener questions are in this week as well. Welcome to our very first podcast - a podcast for American listeners who are wanting to learn a little bit more about the "beautiful game". Tonight: An introduction, Accrington Stanley, Mbappé, us, and a general good chat about what "cheeses us off".